Flying: Luckily I was able to fly instead of drive. The drive would be something like 18-20 hours (I think), so this way I got much more time with the family instead of time in the car. Since Eugene is such a tiny airport, there are not too many direct flights. Usually you have to fly to Portland, Seattle, or San Francisco and then onto your final destination. Yes, I could go to Portland airport, but that is another 2 hour drive and then you need to park, yada yada. Anyhoo, my flight layover was in San Francisco. Landing and seeing all the familiar sites brought back all sorts of good memories--made me miss the bay area. I even saw the green roofs of the storage building next door to my old apartment. Not to mention, the very common SFO delay. Pre-Thanksgiving Turkey: I'm not lying in my blog title, it really was an early holiday celebration. When I arrived home on Thursday evening, my mom had put together all the works: roast turkey, salad, mashed potatoes, broccoli, and butternut squash. Oh how I love turkey - gobble gobble goodness. Usuals: Every trip home is full of usual, must-do activities. To start, I got my hair cut at my favorite salon, Entourage. Nada, Josh's mom, introduced me to these wonderful ladies a few years ago. Nikki did my hair this time and we added some dark blond under-tones and a bit longer on the sides. Also, my mom and I went and had our oh-so-relaxing pedicures. I picked a fun Christmas color called Glove You So Much (aren't nail polish names fun--interesting job, nail color decider). Discovery: As I was betraying my Starbucks and getting a Winter Dream Tea Latte at Coffee Bean and Tea Leaf in the Forum, I spied a "coming soon" for the Counter Burger. Yes, one of my favorite restaurants from the bay is coming to Encinitas. If only it were open now! They say December - let's certainly hope so I can eat it on my next visit home. Dogs: Not just Keely, but many dogs. Many, many dogs. In fact, I counted about 25 dogs. And all at the Vista Sun "Dog" Park. This is my mom's dream come true, while I was reminded of the movie All Dogs go to Heaven. On week nights, the neighborhood dog owners all come out and let their dogs lose at Sun Vista, a "new" park down the street from our house (the area below the former "dirt area" off La Posta and I say "new" because it's not really new but still seems new to me since it was build after I moved to the bay area). The dog people were talking about walking at the Encinitas Christmas Parade - HA, that'd be hilarious. Olivenhain Craft Fair: Bummer for mankind, no scrunchies or Judy's pies this year at the fair (many of you may know the story of Jessica and I hosting a stand at the fair when we were kids). 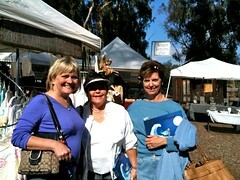 Saturday morning, Sue, Pat, my mom, and I were dropped off at the fair (dad=taxi). Mom and I used to go to this fair every year, so I was line memory lane walking around. I got a fuzzy, soft scarf to help battled the cold Oregon weather. FYI - Olivenhain Meeting Hall is the area were Lindsay and I used to ride horses! Oregon Influences: I made a comment at the hair salon how nice the weather was that day--they all looked at my weirdly. Good weather? It's like mid 60s and it hit me that this is SoCal, not Oregon and this is cold. Here I am all happy it's warm; my SoCal roots are failing me! Then I had to get gas for my mom's car, and I was actually happy to pump my own gas (rather than awkward instruct the gas person "uh full tank, filler 'er up, regular, uhhh...). Food: O'Neills are big on food, so I am obligated to write about some highlights on where and what was eaten. Qe'ro, a super delicious Peruvian restaurant on 101 in downtown Encinitas. I had tasty sweet potatoes, sage roasted mushrooms, and swiss chard dish. All caramelized goodness. I even sneaked a few bites of my mom's chicken and quinoa. Roy's La Jolla, always a favorite with the melt-in-your-mouth misoyaki butterfish and Hawaiian Martini. Chicks, my hole-in-the-wall chicken rice bowl favorite. Froyo: Back to California means back to froyo land. Hurray! Of course I had to indulge daily. Sadly former favorite, La Costa Yogurt Shack was a bit of a disappointment since they apparently changed ownership and yogurt brands a few months ago (yes, I asked). However, Golden Spoon came through as usual (must say they are consistent there and never fail to please). Plus more seem to be popping up--just too little time! Most notable flavor of the visit: cinnamon. Lindsay: Lindsay has been crazy busy with applications and the end of the semester, so we decided to meet halfway between Encinitas and Pasadena - at South Coast Plaza in Costa Mesa. We made Grandma Ruth jealous and had lunch at Claim Jumper (that's one of Grandma's favs). Lindsay opened her b-day gift from me (btw her actual b-day is 11/18 which happens to be my parent's anniversary as well). 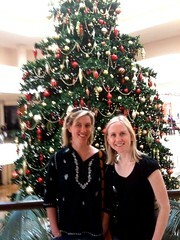 Then we shopped around the mall for some early Christmas gifts. Last, we ended up at Starbucks for a tea break--apparently I just can't get enough (that or my family found out about my discount). And that concludes my wonderful (and sunny/warm) weekend at home. Next trip coming soon...Napa for my mom's 60th B-day in December! Oh, and don't forget to check out more pictures on Flickr!